Update [11-21-2017]: Please see this code snippet for my current preferred implementation. I recently made the switch to TensorFlow and am very happy with how easy it was to get things done using this awesome library. Tensorflow has come a long way since I first experimented with it in 2015, and I am happy to be back. Since I am getting myself re-acquainted with TensorFlow, I decided that I should write a post about how to do batch normalization in TensorFlow. It’s kind of weird that batch normalization still presents such a challenge for new TensorFlow users, especially since TensorFlow comes with invaluable functions like tf.nn.moments, tf.nn.batch_normalization, and even tf.contrib.layers.batch_norm. One would think that using batch normalization in TensorFlow will be a cinch. But alas, confusion still crops up from time to time, and the devil really lies in the details. Perhaps the easiest way to use batch normalization would be to simply use the tf.contrib.layers.batch_norm layer. So let’s give that a go! Let’s get some imports and data loading out of the way first. 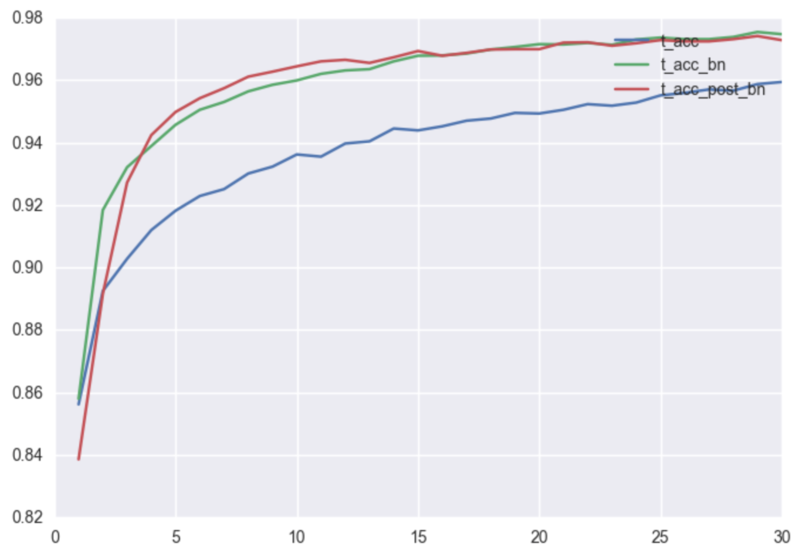 Normalize layer activations according to mini-batch statistics. During the training step, update population statistics approximation via moving average of mini-batch statistics. Normalize layer activations according to estimated population statistics. Do not update population statistics according to mini-batch statistcs from test data. Now we can define our very simple neural network for MNIST classification. Hey graph, update the moving averages before you finish the training step! And we’re done! We can now train our model and see what happens. Below, I provide a comparison of the model without batch normalization, the model with pre-activation batch normalization, and the model with post-activation batch normalization. As you can see, batch normalization really does help with training (not always, but it certainly did in this simple example). You have the choice of applying batch normalization either before or after the non-linearity, depending on your definition of the “activation distribution of interest” that you wish to normalize. It will probably end up being a hyperparameter that you’ll just have to tinker with. There is also the question of what it means to share the same batch normalization layer across multiple models. I think this question should be treated with some care, and it really depends on what you think you’ll gain out of sharing the batch normalization layer. In particular, we should be careful about sharing the mini-batch statistics across multiple data streams if we expect the data streams to have distinct distributions, as is the case when using batch normalization in recurrent neural networks. As of the moment, the tf.contrib.layers.batch_norm function does not allow this level of control.